Edward Snowden exposed the need for us to have a more secure way of sending messages via smartphone, it is now known that the NSA monitors all messages across the globe. All text messages are logged and crawled by an A.I, these messages are stored permanently in a NSA server for future references, this includes SnapChat. Remember, everything man made can be unmade. Even with these so called secured text messengers, these chat messages are still retrievable. The technology driving most of these programs is called “end-to-end encryption,” which means that a message is ciphered before it’s sent and then deciphered after its received, with a powerful computer, these secure encrypted message can be cracked, this is because there is a need to read secret messages between terrorist, loan sharks, murderers, drug lords and more. Works great on Android 8.0 Oreo / Android 9.0 [ Popsicle, Pancakes or Pie ] smartphones such as Samsung Galaxy, Huawei Mate, Oppo, Vivo, XiaoMi, Nokia, and also Apple’s iOS iPhone. 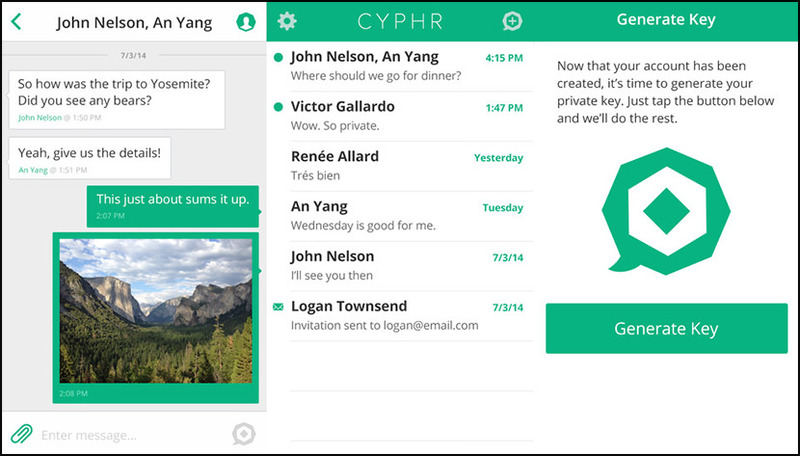 Cyphr is a free, easy-to-use, encrypted messaging app for Android and iOS. All messages are encrypted, private and 100% yours. Create a free account, generate your public and private key pair, and start messaging. 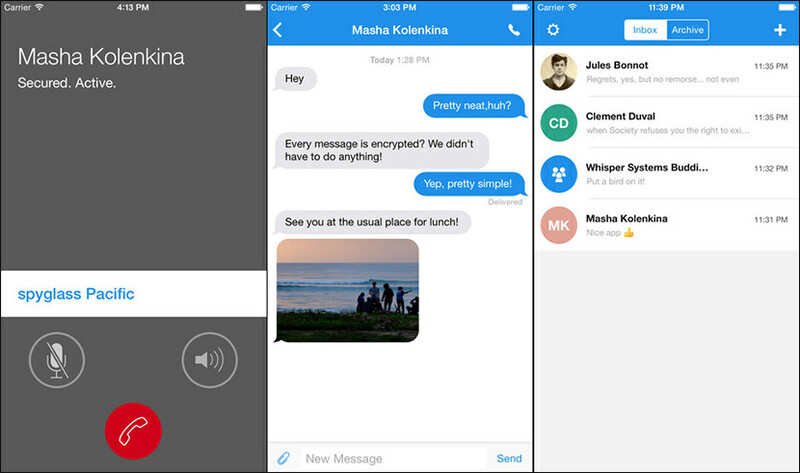 Cyphr makes encrypted messaging easy. All messages are encrypted, private and 100% yours. Generate your public and private key pair so only you can read your messages, start group conversations with friends, and share attachments privately. Only you can read your messages – Cyphr is a zero-knowledge messaging app. This means we cannot read, decrypt or share your messages. Cyphr generates a unique public and private key pair so only you and your friend can read your conversation – not us, not your wireless provider and not 3rd parties. Privacy by design – All messaging apps require some metadata in order to work. We specifically designed our servers to store the minimal amount of data necessary and then delete that data after messages are successfully delivered. Multiple layers of security – When you use an unencrypted messaging app or traditional SMS/MMS messaging, you are essentially putting your messages in a mailbox that anyone can access. When you use Cyphr, you gain multiple layers of security. Imagine everyone has a mailbox that requires a public key for inserting mail and a private key for withdrawing mail. 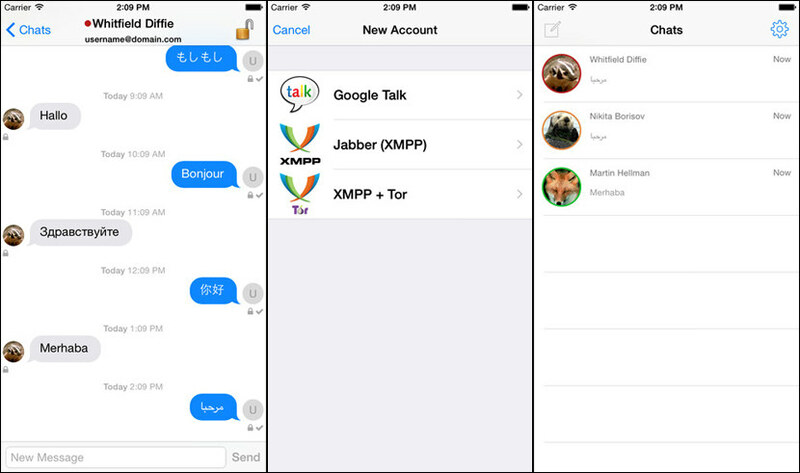 ChatSecure is a free and open source messaging app that features OTR encryption over XMPP. You can connect to an existing Google account, create new accounts on public XMPP servers (including via Tor), or even connect to your own server for extra security. Unlike other apps that keep you stuck in their walled garden, ChatSecure is fully interoperable with other clients that support OTR and XMPP, such as Adium, Jitsi, and more. ChatSecure only uses well-known open source cryptographic libraries to keep your conversations private. 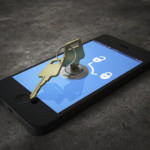 Other apps may make claims about ‘military grade’ security but, without publicly auditable source code and verifiable end-to-end encryption, you cannot be truly safe. XMPP with TLS certificate pinning. OTR for verifiable end-to-end encryption and forward secrecy. Tor to help bypass restrictive firewalls. SQLCipher to locally encrypt conversation logs. 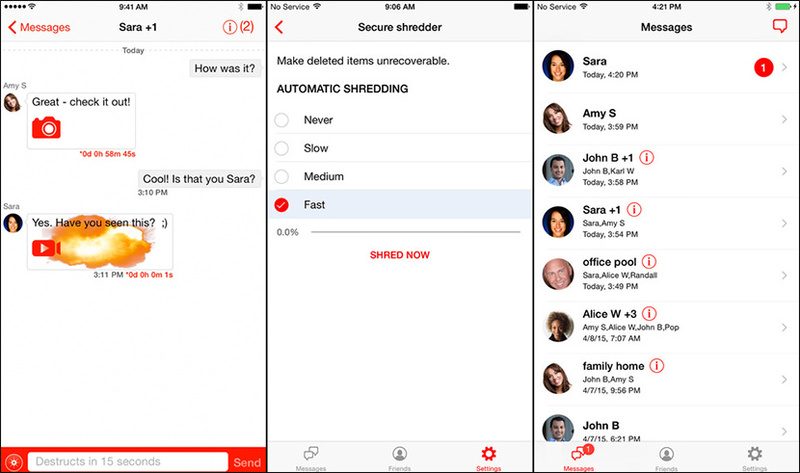 Wickr is a messaging platform designed to give control over security back to the users. Trusted by world leaders, executives, journalists, human rights activists, celebrities, and your closest friends. Wickr’s code, policies and promises have been verified by four of the most respected organizations in the world. The Wickr team is made up of security and privacy experts dedicated to building a strong social system around the world by providing a secure, private communication platform to everyone. Wickr is headquartered in San Francisco. 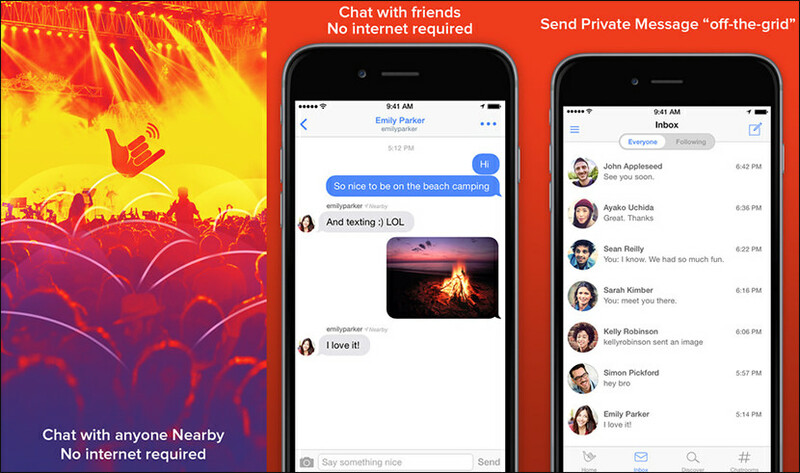 FireChat works even without an Internet connection or cellular phone coverage. Use it anywhere: planes, public transportation, cruise ships, campuses, and crowded events. All you need is a few people using FireChat. Free instant messaging. No network or data plan needed. Welcome to the Internet of us. You will be automatically connected directly with one another, creating your own network for public and private communications. The more people use it, the bigger and faster your network becomes. And when you do have access to a reliable Internet connection or cellular network, FireChat helps you reach people worldwide and build your audience faster than on any social network, for free. With BBM® what you share is always yours to control – even once it’s left your phone. Download it for free on iOS®, Android™, Windows Phone® and BlackBerry®. BBM is wel known for its secure messages, unfortunately, with the introduction of iPhone, BlackBerry died a slow death. I don’t see end to end strong encryption listed as a feature. Without this feature, implemented properly where no one but sender and receiver have access to encryption keys, it is possible for the company behind BBM, hackers, government agencies and other third parties, to read/monitor/log the contents of users messages. Alternative messaging apps that feature end to end encryption include Threema, reTXT, and Bleep. There are others but they typically require your real phone number to register and full access to your entire contacts book. 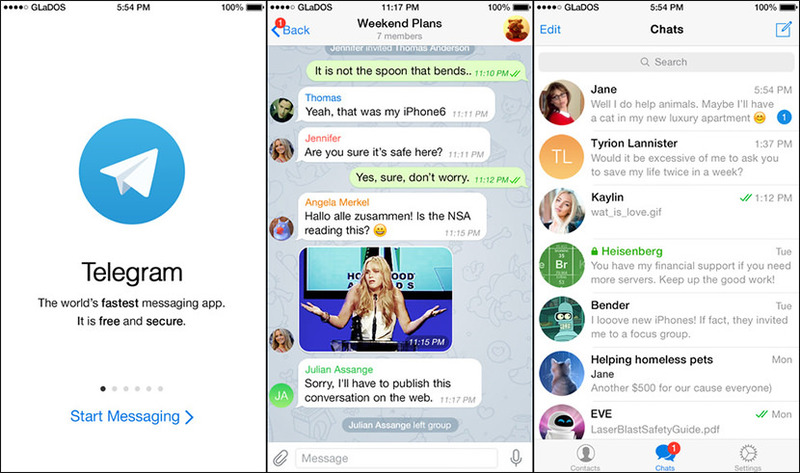 Telegram is a messaging app with a focus on speed and security. It’s superfast, simple, secure and free. 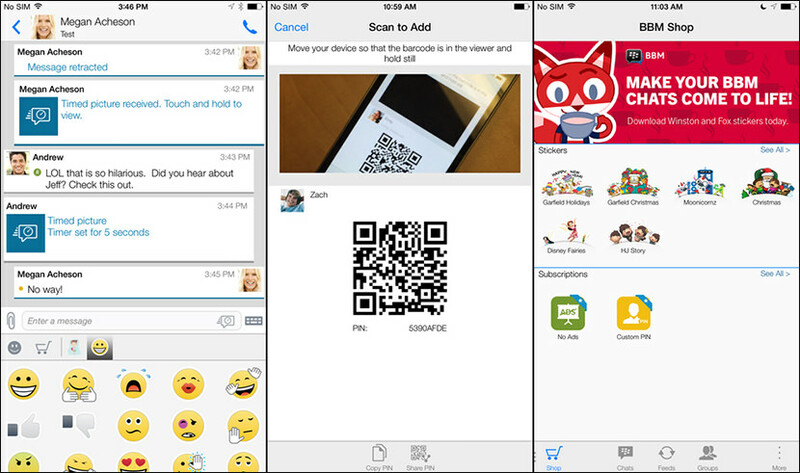 Telegram seamlessly syncs across all of your devices and can be used on desktops, tablets and phones alike. You can send an unlimited amount of messages, photos, videos and files of any type (.doc, .zip, .pdf, etc.). Telegram groups and broadcast lists have up to 200 members. Be sure to check our website for a list of Telegram apps for all platforms. 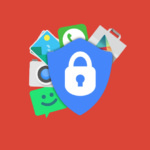 SECURE: We made it our mission to provide the best security among mass messengers. Telegram is based on the MTProto protocol that is built upon time-tested algorithms to make security compatible with high speed delivery and reliability on weak connections. GROUP CHAT & SHARING: With Telegram, you can form large group chats and broadcast lists of up to 200 members, quickly share large videos, documents (.doc, .ppt, .zip, etc. ), and send an unlimited amount of photos to your friends. 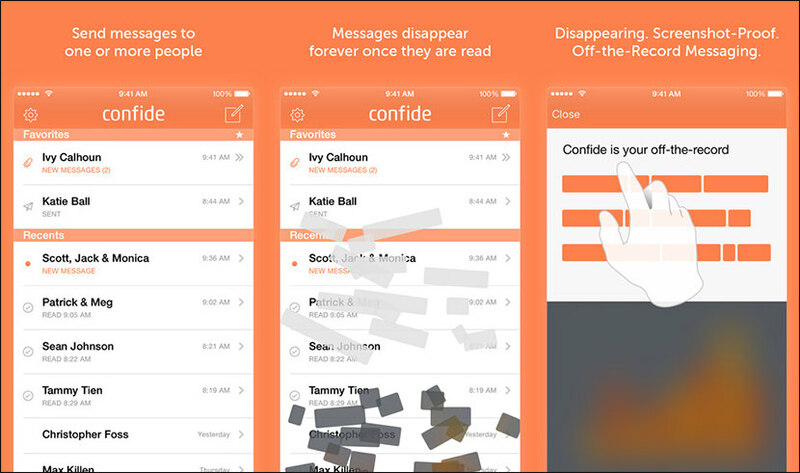 Confide is your off-the-record messenger. We combine end-to-end encryption with disappearing and screenshot-proof messages to foster private, unfiltered, and efficient communication. Backed by some of the best early-stage investors in the world, Confide has been featured in Fortune, Forbes, Bloomberg/BusinessWeek, NYT, Washington Post and more. And Confide has been used in over 180 countries worldwide. Privacy is possible, Signal makes it easy. Using Signal, you can communicate instantly while avoiding SMS fees, create groups so that you can chat in real time with all your friends at once, and share media or attachments all with complete privacy. The server never has access to any of your communication and never stores any of your data. Say Anything. Signal uses an advanced end to end encryption protocol that provides privacy for every message every time. Open Source. Signal is Free and Open Source, enabling anyone to verify its security by auditing the code. Signal is the only private messenger that uses open source peer-reviewed cryptographic protocols to keep your messages safe. Be Yourself – Signal uses your existing phone number and address book. There are no separate logins, usernames, passwords, or PINs to manage or lose. Group Chat. Signal allows you to create encrypted groups so you can have private conversations with all your friends at once. Not only are the messages encrypted, but the Signal server never has access to any group metadata such as the membership list, group title, or group icon. Fast. The Signal protocol is designed to operate in the most constrained environment possible. 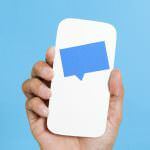 Using Signal, messages are instantly delivered to friends. Speak Freely – Make crystal-clear phone calls to people who live across town, or across the ocean, with no long-distance charges. Since its inception in 1952, the National Security Agency has been shrouded in secrecy; for years the White House denied its very existence. For the first time since 9/11 changed everything, cameras go beyond the closed doors of the NSA, deep inside the agency’s over 2 million square foot top-secret compound. Can you tell me only text part is encryption secure or video chat is also encryption secure? As I found many leaked videos are stolen from some of online chat/video applications. I’ve tried several app on the list above but none of them give the same experience like the encrypted messaging i use right now, its called StealthChat. Beside provide a high level security they added some unique concept such as lock your app screen with scramble words in certain time so nobody can’t snooping on your conversation. I have been using Signal Private messenger for almost two years and it never disappoints, i keep reading about stuff that how secure the signal private messenger is. Recently they have extra level of security called sealed sender which is very unique and Signal messenger is first and only messenger to offer such kind of extra layer of security.